When Wolsten died in 1689 his son Gilbert Adderley took over the estate until his death on the 30th December 1734. During his life he would have seen many changes in the land around him, for after 1720 the face of England was transformed by increasing industrialisation and the rise of Britain as a major economic power in the world. Whilst industrialisation is often associated with the big cities, its effects would be keenly felt by communities such as Weddington where the living for the average inhabitant would have been modest. For instance, a typical labourer would have earned 1 shilling a day, but demand for work would have fluctuated - the most he could have expected to earn would have been about £13 a year. A typical small farmer would make about £15 a year, of which £11 would feed a couple and four children. A pauper would get 4 to 5 shillings a week poor relief, whereas a yeoman (someone owning freehold land worth at least 40 shillings) would have incomes of £40-50 a year. In contrast the gentry would have lived well on incomes of £200 to £500 a year. The changes to this rural way of life was twofold. First, the government-imposed Enclosure Acts meant that vast areas of farmland were 'enclosed' at this time, combining strips historically worked by individual tenants into fields to be cultivated by hired labour. Some tenant farmers gravitated to the growing industrial towns (the nearest being Nuneaton), but most had to remain on the land as labourers. Many independent and tenant farmers found themselves unemployed. Large masses of property-less people now looked to the cities for an answer. The remaining wealthier farmers were now free to experiment with new crops, new growing techniques and new breeds of sheep and cattle - and agricultural productivity soared. Second, the higher wages offered by the urban centres attracted the rural poor. The quantity and variety of commercial goods coming into and displayed in the cities drew the attention of those in pursuit of material possessions - a problem that remains for rural communities today. Furthermore, the increased demands of London and other growing cities such as Birmingham effected a tremendous strain on the economy, which in turn depleted the peasantry of its traditional way of living, as goods were produced for increased populations further living afield. Even the trip to the large cities became attractive and easier due to the construction of a national road, or 'turnpike', system which drastically reduced the journey times of both freight and passenger traffic. Gilbert Adderley played his part here, building one such road: ‘Derby Lane’ later to become known as Weddington Road, the main artery of Weddington village. He also developed the village of Weddington, and four farms and a Manor House are recorded as existing in 1730. In addition, he restored the local Church in 1733 which had been badly damaged in the Civil War skirmish. The chancel nave and west tower were rebuilt in red brick at this time. This latter act may have been initiated by his religious connections, for he was married to Mercy, the daughter of the Reverend Dormer Sheldon of Abberton. The Church connection with Weddington Castle and its owners continued when Gilbert’s son, Thomas, inherited the estate in 1738. He made a conveyance of the manor and presented it to the church in 1753, in the person of the Reverend Thomas Liptrott (1706-1797) who was Rector of Fenny Drayton and Weddington, as well as being schoolmaster of Nuneaton Grammar School in the 1753-8 period. Rev. Liptrott was the husband of Thomas Adderley's sister Elizabeth. It seems the Adderleys maintained their links with the Castle after this, and when Mercy Adderley remarried to Francis Vincent, a barrister at Inner Temple, in 1758, Francis commissioned a painting by the artist Arthur Devis of himself and family at the Castle (pictured above). It was, however, not a faithful representation of the estate - this is unfortunate as it would have provided a rare image of the Castle before its later castellated additions. Following this exchange, the Castle remained fairly undeveloped for the next 50 years or so. During this time the estate passed to Amice, second daughter of the Reverend Philip Bracebridge, Thomas Liptrott's cousin. 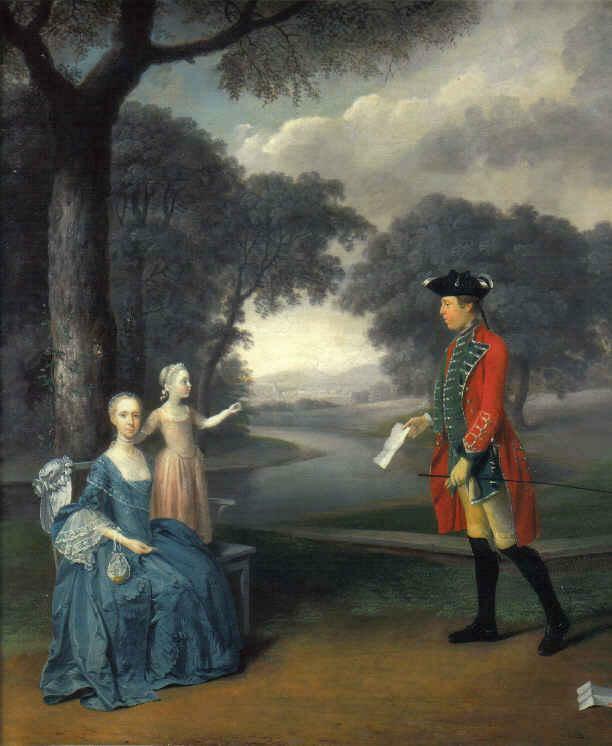 Amice married a George Heming of Jamaica and they later had a son, Samuel Bracebridge Heming who became the New Incumbent of the manor in 1799 and took over the Weddington Estate, which now had a population of 60, in 1804. Meanwhile Britain was developing rapidly. After 1760 road and river freight were complemented by a canal network. Foundries and coal mines flourished after coal-fired iron smelting was developed. A series of inventions made it possible to industrialise spinning and weaving (see right*), initially using river power, and the nearby town of Nuneaton benefited from this new industry, accelerating the migration from the surrounding villages. The steam engine, invented in 1774 to pump out coal mines, soon mechanised the process completely. Eighty-hour weeks were the norm in the new factories, which relied heavily on child labour. Industrial towns mushroomed, without gaining any form of statutory representation. Sanitation, lighting and paving were handled by local committees, empowered through piecemeal legislation. The development of industrial England massively outstripped politicians' ability to manage it, and represented a radical change to the traditional rural ways of life of villages such as Weddington. 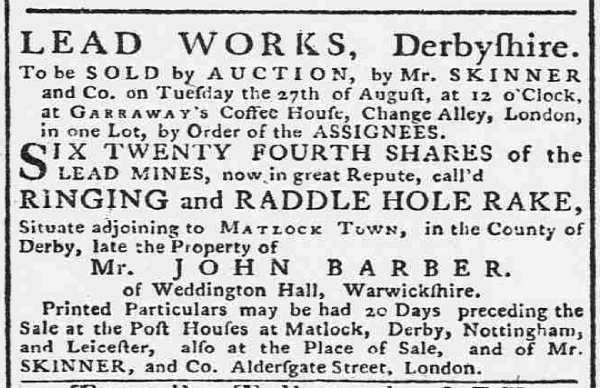 Interestingly, it appears that a local contributor to the Industrial Revolution, John Barber, inventor of the gas turbine lived at Weddington Hall for a time, as a local advertisement from 1782 shows. Furthermore, with the advent of the nineteenth century, the Castle would undergo its own radical changes under a new owner, in the person of Lionel Place. * picture of ribbon-weaver taken from a feature on Nuneaton in 'The Graphic Illustrated' 1881.